Occlusion can be described as the way your teeth bite together. Not only is correcting the alignment of your teeth (straightening) with Invisalign important, but correcting your molar relationship is just as important. When malocclusion (misalignment) occurs it can have expensive and damaging effects throughout your entire mouth. These can include but are not limited to hypersensitivity, mobility, abfractions, excessive wear, temporomandibular (TMJ) pain, and even tooth fracture. The above mentioned conditions can cost thousands of dollars to repair if not treated proactively. The masticatory muscles can generate several hundreds of pounds of force per square inch, therefore it is important to have bilateral and even occlusal contact. If you wake up with soreness in the jaw or ear area or clench or grind your teeth, you may experience TMJ pain. Just imagine all those pounds of pressure applied to a single misaligned tooth over a period of time. The destruction can be extensive and very expensive. Even after restorations are placed, without correcting the bite, it will be a reoccurring event. Edward Angle, the father of modern orthodontics, is credited with classifying malocclusion. He has based his classifications on the position of the maxillary first molar. Angle determined the mesiobuccal cusp of the upper first molar should align with the buccal groove of the mandibular first molar. The upper arch is a smooth curve through the central fossae of the posterior teeth and the cingulum of the canines and incisors. In the lower arch, is a smooth curve through the buccal cusps of the posterior teeth and the incisal edges of the anterior teeth. When both arches present this formation, the teeth should all be in a line of occlusion. Any variation would result in a malocclusion type. It is possible to have different malocclusion classifications on the right and left sides. It is important to note that crowding and spacing are not considered malocclusion, yet can complicate any of the occlusion types if not treated properly. Invisalign works uniquely to correct the above situations. The aligners protect the entire arch of teeth, providing full coverage, unlike traditional brackets and wires. This helps with the prevention of proclintion of the lower incisors. With Invisalign it is also possible to distalize one molar at a time (sequential distalization). 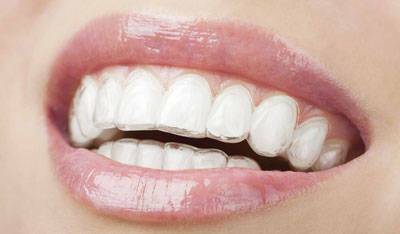 This movement is built into the aligners, however is not predictable with brackets and wires. With sequential distalization, space is created and the maxillary arch can be expanded (helpful to widen the buccal corridor and reduce overjet with Class II malocclusion). This is done with aligners alone, no additional palatal expanders are needed. The aligners help to prevent unwanted molar extrusion, once again due to the full coverage. Utilizing elastics can take place earlier on in treatment with Invisalign than with traditional brackets and wires (elastics are need to correct both Class II and Class III malocclusion). The elastics will assist with anchorage of the aligners as well. Once the teeth contact evenly, the muscles can function in coordination and reduce or eliminate any temporomandibular discomfort, abfraction, excessive wear, hypersensitivity, and mobility. During treatment the full coverage of the aligners act to protect the opposing arches from further damaging teeth (occlusal wear) as a result of grinding and clenching. Remember to have a long term retention plan set in place prior to leaving your providers office once your teeth are properly positioned.